My seventh ground of 2016 was on Tuesday 29th March at Kiln Park in Raunds, Northamptonshire. 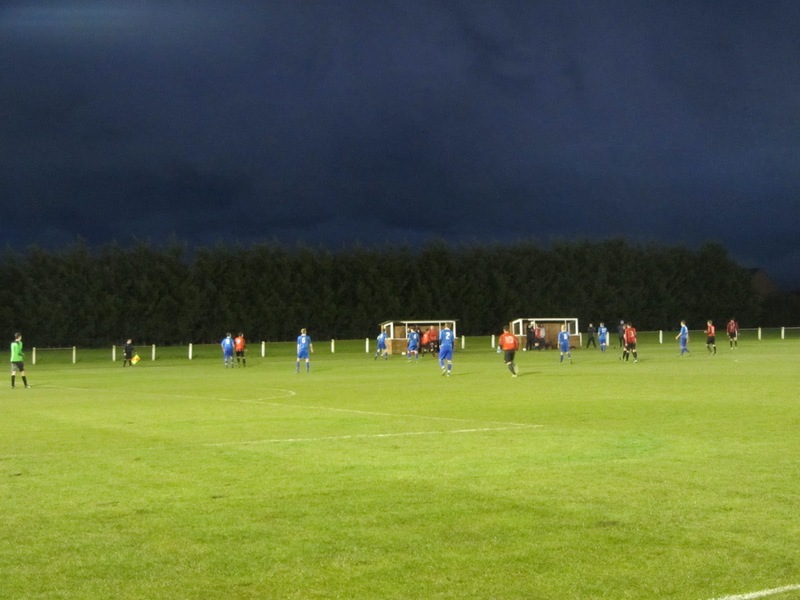 The match was Raunds Town vs. Rushden & Higham United in United Counties League Division One. Kiln Park is on the northern edge of the town of Raunds. It is just off the A45 road with a service station directly to the north of the ground. It is 8 miles east of the nearest railway station at Wellingborough and has been the home of the club since 1991. The western side of the ground has an all-seater stand with a capacity of 253. This includes a section of 24 seats for officials which is separated from the remaining seats by concrete. Next to this stand is the clubhouse building which includes a bar and player dressing rooms. This building then leads out towards the car park at the side of the venue. Towards the southern end of this side of the ground there is an additional covered standing area. The rest of ground is uncovered standing behind a metal and concrete barrier. There are large grass areas behind the barriers on the other three sides of the pitch. This is particularly true down the eastern side of the ground where the dugouts are positioned. The viewing area here is set quite a way back from the pitch. Raunds began the game well and took the lead in the 8th minute when a corner was headed on by Karl King allowing Marc Harrison to nod in on the line. The home side doubled their lead in the 16th minute when a ball over the top to King beat the offside trap and he was able to turn and shoot into the bottom corner from 25 yards. 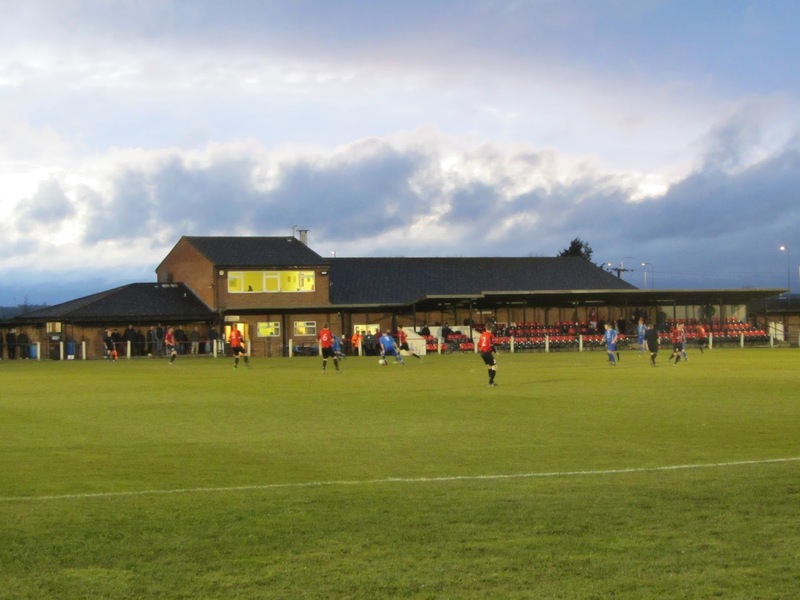 Rushden reduced the deficit in the 22nd minute when the ball was crossed into the box from the right-wing and Aaron Cormack was able to get on the end of it to slid the ball in. Just before the half-hour mark the visitors then equalised from the penalty spot after the keeper felled a Rushden attacker. Jory Mann stepped up and smashed the penalty down the middle. There was then another flurry of goals just before the interval. Raunds went 3-2 up after a counter-attack saw Nathaniel Gosnal-Tyler pick up the ball on the left wing, cut inside a couple of defenders and shoot low inside the near post. The hosts were pegged back again almost immediately though -Jack Dyson was running across the area and as he shot from 20 yards a tackle deflected the ball past the keeper. Incredibly there was still time for another goal before the break as the ball was crossed into the box from the left-wing and Karl King rose above all to head down and past keeper into far corner. That was King's 2nd and Raunds' 4th in a breathless first half that had seen seven goals. Sadly the second half didn't live up to the excitement of the first and there were no more goals. Rushden were the better side but came up against a strong performance from Chris Jones in the home goal. The closest they came to securing a 4-4 draw was in the 72nd minute when a Rushden attacker was clean through only to be denied by a good save from Jones.